The chairman of the Joint Chiefs of Staff said the United States could help with equipment and intelligence techniques after returning from a six-day trip to Latin America punctuated by news of beheadings and intimidation by Mexican drug cartels. Mexico could borrow from U.S. tactics in the fight against terrorism as it battles a crisis of drug-related violence along the U.S.-Mexico border, the top U.S. military officer said Friday. Returning from a six-day trip to Latin America punctuated by news of beheadings and intimidation by Mexican drug cartels, the chairman of the Joint Chiefs of Staff said the United States could help with equipment and intelligence techniques. Adm. Mike Mullen would not be specific about what kind of intelligence or surveillance help the United States might offer, but said he saw ways to employ experience the United States has gained in the ongoing hunt for extremists and terrorists. He would not say whether there may already be U.S. drones flying over bloodstained cities such as Ciudad Juarez, where 17 bodies came into the morgue on one day recently, including the city police force’s second-in-command and three other officers. “Obviously it affects us because of the relationship between the two countries,” Mullen said during a telephone news conference as he flew to Washington following meetings in Mexico, his last stop. Mullen referred to the spike in violence as a crisis, and said it occupied much of his discussions with Mexican military leaders. More than 1,000 people have been killed in Mexico in drug-related violence this year. 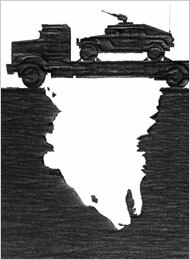 In 2008, the toll doubled from the previous year to 6,290. Both the U.S. and Canada have warned that murders related to drug activity in certain parts of Mexico, particularly along the border with the U.S., raised the level of risk in visiting the country. There are signs the violent competition among Mexican drug and smuggling cartels is spilling across the border, as cities in Arizona report increases in such crimes as home invasions. More than 700 people were arrested as part of a wide-ranging crackdown on Mexican drug cartels operating inside the United States, the Justice Department said last month. Last weekend, Defense Secretary Robert Gates said he also saw opportunities for the U.S. military to help with military training, resources and intelligence. “It clearly is a serious problem,” he said. President Barack Obama was briefed Saturday by Joint Chiefs of Staff Chairman Adm. Mike Mullen about the drug wars in Mexico and wanted to know how the United States can help. Mullen briefed Obama Saturday morning about discussions with Mexican military leaders about the drug wars there. THE Taliban didn’t wait long to test Barack Obama. On Tuesday, militants bombed a bridge in the Khyber Pass region in Pakistan, cutting off supply lines to NATO forces in neighboring Afghanistan. This poses a serious problem for President Obama, who has said that he wants more American troops in Afghanistan. But troops need supplies. The attack was another reminder that the supply line through Pakistan is extremely vulnerable. This means that the Obama administration might have to consider alternative routes through Russia or other parts of the former Soviet Union. But the Russians were unhappy about the Bush administration’s willingness to include Ukraine and Georgia in NATO, and they will probably not want to help with American supply lines unless Mr. Obama changes that position. American Troops In Afghanistan Out On A Limb? In addition to our guaranteeing that NATO will not expand further, the Russians seem to want the United States to promise that NATO forces will not be based in the Baltic countries, and that the United States will not try to dominate Central Asia. In other words, Russia wants the United States to pledge that it will respect the Russian sphere of influence in the former Soviet Union. They will probably want this guarantee to be very public, as a signal to the region — and the Europeans — of Russian dominance. This is one guarantee that Mr. Obama will not want to give. There is also no certainty that countries in the Russian sphere of influence, like Kazakhstan and Turkmenistan, would agree to let the United States use these routes without Russian permission. Here is where Mr. Obama could use some European help. Unfortunately, that’s not likely to come soon. Many Europeans, particularly Germans, rely on Russia’s natural gas. In January, the Russians cut natural gas shipments to Ukraine. As much of the Russian natural gas that goes to Europe runs through Ukraine, the cutoff affected European supplies — in the middle of winter. Europeans can’t really afford to irritate the Russians, and it’s hard to imagine that the Germans will confront them over supply routes to Afghanistan. Pakistan, unfortunately, is hardly a reliable partner either. So how can Mr. Obama reconcile the two goals of strengthening the American presence in Afghanistan while curbing Russian expansionism? The answer is to rely less on troops, and more on covert operations like the C.I.A. Covert operators are far more useful for the actual war that we are fighting (and they can carry their supplies on their backs). The primary American interest in Afghanistan, after all, is preventing terrorist groups from using it as a base for training and planning major attacks. Increasing the number of conventional troops will not help with this mission. What we need in Afghanistan is intelligence, and special operations forces and air power that can take advantage of that intelligence. Fighting terrorists requires identifying and destroying small, dispersed targets. We would need far fewer forces for such a mission than the number that are now deployed. They would make us much less dependent on supply deliveries, which would help solve our Russian problem. Winding down the conventional war while increasing the covert one will demand a cultural change in Washington. The Obama administration seems to prefer the conventional route of putting more troops on the ground. That would be a feasible strategy if supply lines to Afghanistan were secure. The loss of that bridge yesterday demonstrates very clearly that they are not. Could American troops in Afghanistan be out on a limb? Attacks on the U.S. and NATO supply lines from Pakistan continue. The Taliban seems to have realized that attacking the supply route has less risk that facing U.S. and NATO troops in the field. The U.S. and NATO troops in Afghanistan cannot follow the Taliban into Pakistan, which has resulted in U.S. drone attacks which Pakistan continues to protest. Today, Kyrgyzstan’s government submitted a draft bill to parliament calling for the closing of the U.S. base at Manas that is key to the military campaign in Afghanistan. The U.S. Air Base has been especially important, both the State Department and Pentagon say…. And yesterday the U.S. Joint Chiefs of Staff — that just a week ago asked for more troops for Afghanistan to get to some 35,000 — got a Pentagon study recommending lower goals in Afghanistan. Senior U.S. commanders are finalizing plans to send tens of thousands of reinforcements to Afghanistan’s main opium-producing region and its porous border with Pakistan, moves that will form the core of President Barack Obama’s emerging Afghan war strategy. A classified Pentagon report urges President Barack Obama to shift U.S. military strategy in Afghanistan, de-emphasizing democracy-building and concentrating more on targeting Taliban and al-Qaida sanctuaries inside Pakistan with the aid of Pakistani military forces. Defense Secretary Robert Gates has seen the report prepared by the Joint Chiefs of Staff, but it has not yet been presented to the White House, officials said Tuesday. The recommendations are one element of a broad policy reassessment under way along with recommendations to be considered by the White House from the commander of the U.S. Central Command, Gen. David Petraeus, and other military leaders. A senior defense official said Tuesday that it will likely take several weeks before the Obama administration rolls out its long-term strategy for Afghanistan. The Joint Chiefs’ plan reflects growing worries that the U.S. military was taking on more than it could handle in Afghanistan by pursuing the Bush administration‘s broad goal of nurturing a thriving democratic government. Instead, the plan calls for a more narrowly focused effort to root out militant strongholds along the Pakistani border and inside the neighboring country, according to officials who confirmed the essence of the report. The officials spoke on condition of anonymity because they were not authorized to discuss the plan publicly. The recommendations are broadly cast and provide limited detail, meant to help develop the overarching strategy for the Afghanistan-Pakistan region rather than propose a detailed military action plan. During a press conference Tuesday, White House Press Secretary Robert Gibbs noted the ongoing “comprehensive reviews” of Afghan policy, but did not say when they would be made public. Pentagon spokesman Bryan Whitman would not comment Tuesday on the details of the Joint Chiefs’ report, but acknowledged that the U.S. relationship with Pakistan is a critical component for success in Afghanistan. “When you talk about Afghanistan, you can’t help but also recognize the fact that the border region with Pakistan is obviously a contributing factor to the stability and security of Afghanistan, and the work that Pakistan is doing to try to reduce and eliminate those safe havens, and the ability for people to move across that border that are engaged in hostile intentions,” Whitman said. The Obama administration has asked the military’s Joint Chiefs of Staff to cut the Pentagon’s budget request for the fiscal year 2010 by more than 10 percent — about $55 billion — a senior U.S. defense official told several newspeople. For as long as anyone can remember, the Department of Defense built its budget based upon a national strategy that the National Command Authority authorized. Simply stated, the President and his top advisors told DoD what they would need, say a two simultaneous war strategy in two different threaters, and the Pentagon costed that stategy in terms of manpower, aircraft, ships, etc. In its starkest terms, building the DoD budget was like asking yourself where you wanted to go, asking the cab driver how much that would cost and then setting aside the money to get you where you needed to be. When we want to go, say, to church, we give the cab driver the money needed for that trip. The Obama administration has asked the military’s Joint Chiefs of Staff to cut the Pentagon’s budget request for the fiscal year 2010 by more than 10 percent — about $55 billion — a senior U.S. defense official told FOX News. Some overall budget figures are expected to be announced Monday. Obama met Friday at the White House with a small group of military advisers, including Admiral Mike Mullen, chairman of the Joint Chiefs, Gen. James Cartwright, vice chairman, and Gen. Jim Jones, National Security Council chairman. Many will applaud the president for cutting what is widely seen as an over-inflated budget. But many others will see the way this cut was made as questionable without the strategic thought underpinning the budget number. And many wives, friends, husbands and family members of service members will want to know if their service people are now more at risk…. U.S. defense budget cuts may target spending on weapons as the Obama administration juggles paying for personnel and wars in Iraq and Afghanistan, the chairman of the Joint Chiefs of Staff said. 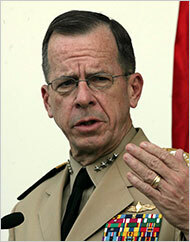 “The most expensive part of our budget is our people,” Admiral Michael Mullen said in an interview yesterday. “There’s not a lot of flexibility with respect to people, unless you start” reducing forces. That is unlikely, meaning the weapons procurement budget, which averaged about 20 percent of fiscal 2008 and 2009 defense spending, will come under increased scrutiny, Mullen said. “We’ve got to fund the wars we are in,” and that “puts an awful lot of pressure” on decreasing spending on weapon modernization and the repair of war-worn equipment, he said. The largest part of the weapons accounts is tactical aircraft, shipbuilding and ground equipment produced by Lockheed Martin Corp., Boeing Co., Northrop Grumman Corp., General Dynamics Corp., Raytheon Co. and BAE Systems Plc. As President-elect Barack Obama convened the first meeting of his national security advisers on Monday, there was just one person at the table that the new president did not choose to have there: Adm. Mike Mullen, the chairman of the Joint Chiefs of Staff. Admiral Mullen, who was selected by Defense Secretary Robert M. Gates for a two-year term, has been on the job for a year. Come January, he will face perhaps the biggest challenge of his career — pivoting from one commander-in-chief to another, in the middle of two wars. Friends describe him as an even-tempered, intellectually curious and politically astute presence who sees the world beyond the immediate battles of the Pentagon and White House — all skills they say will serve him well in the new administration. In the last year, Admiral Mullen has sought advice from the retired generals who revolted against former Defense Secretary Donald H. Rumsfeld, reached out to the former Army chief who was vilified for saying more troops were needed in Iraq and invited to dinner prominent Democrats like Gregory B. Craig, Mr. Obama’s choice for White House counsel. His efforts may have been an attempt to soothe the military after the cataclysmic Mr. Rumsfeld, or an anticipation of a change of administration — or both. You are currently browsing the archives for the Joint Chiefs category.